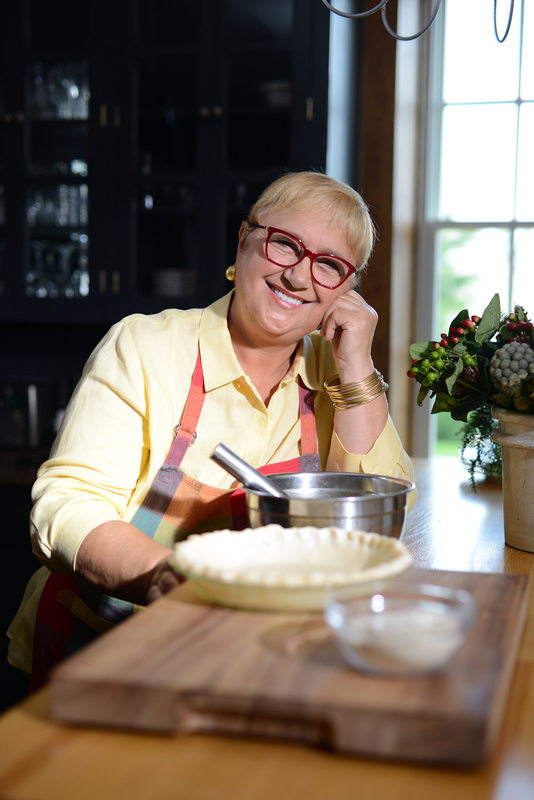 Lidia Bastianich has been a fixture on PBS and part of our Saturday afternoon cooking block, where in recent episodes of “Lidia’s Kitchen” she’s joined once again by her mother and grandkids. She talks to us about her old episodes, that anyone can cook, being mentored by Julia Child, and where she goes when she’s in Los Angeles. We recently aired the family episode with your mom and granddaughter, it made me miss those classic episodes with your family. The kids are really interested. Kids go through periods, they’re small, and then they kind of disappear, they want to do their own thing. And now that they’re getting mature enough they realize how important, the fact to being part of a story, the fact their friends recognize them and watch them. So they’re in the shows and I love it. There’s more of that coming. It made me miss the old Lidia shows in your house because you could tell it was your actual kitchen in Queens. Do you ever think about doing episodes there again? The question is my mother, who is 98, lives with me and bringing in the whole crew and cables all over, I was afraid she might trip or something. So, she’s still here with us and we’re filming away from the house for that reason. I’m sure a lot of viewers like seeing your mom. She comes up to the kitchen where we do it and we come also here and film her in our kitchen so she doesn’t have to travel a lot. It’s just bringing the whole crew that made it a little bit difficult. Speaking of old episodes, wasn’t there a Christmas special with Christopher Walken because your mom worked at his family’s bakery? Exactly. We’re still friends. I worked at Walken’s bakery and then my mother came on. We were friends with the family, with Christopher and the brothers, so we still see each other now and then. What’s your theme or aim with the show? I’m very conscious of the fact that I transmit something to the viewer, that the viewer gets something. If they give me half an hour, I want them to take something of their own. 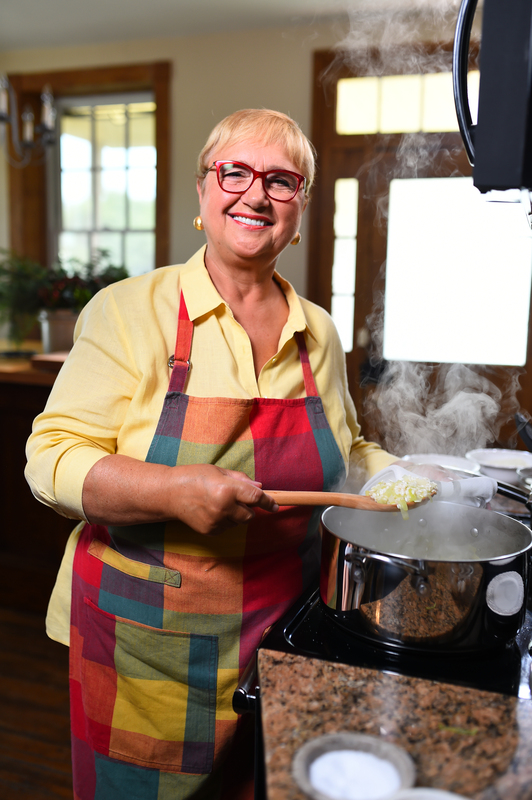 And they do that when they take one of my recipes and they cook it in their home, they bring Lidia in their home. I’m so happy and so proud when I get emails that say, “You know Lidia, I did that and my son loves it.” So what’s important for me is that I teach, that I communicate, that I communicate my passion. That I empower them, because some people don’t think they can cook. It’s not that difficult. It’s not about big chefs, it’s about cooking simple food, straight forward. And if you have good product almost anybody can cook something. Your show is now a PBS classic. I’ve been on the air for 21 years (laughs) and it’s across the United States, I think it’s 98 percent of the PBS stations. I connect to America through PBS and I just love it because on regular trips to different stations, I do fundraising and do events and connect with the people that watch it. What made you originally want to cook on TV back then? It seems like she was very encouraging and mentored everyone from what I hear. She was very giving, she wanted to give. She was not about how much she knew. She wanted to share and she just enjoyed it when people took from her and were able to cook her food and connect to her food. And I think the way she went to France and she was taking in the culture and learned; it was such a revelation to her and she wanted to share with everybody. Do you mention her in your memoir? The world of TV and media has changed so much since then, what keeps it fun for you? You obviously enjoy doing it because you’re still doing it. I am a chef, I’m not an inventive chef, I feel that I am a conduit of my Italian country of birth to my adopted country America. I came here very young and I feel very American. So connecting my two families, if you will, and food evolves all the time. So it’s not something that’s passé if you respect it, if you stay with it. So I am thrilled, because there’s always something new, whether it’s nutrition, or new artisans. It’s so wonderful to see. 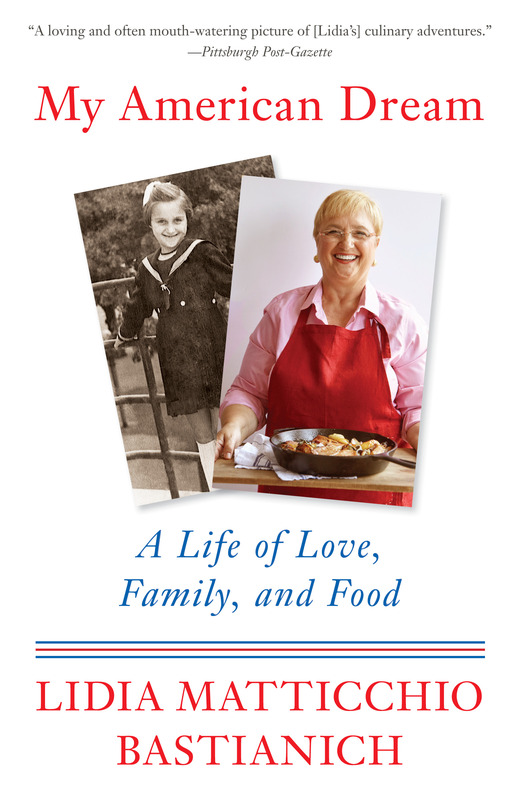 In my memoir, how I started with food was, we were in the part of Italy was given to communist Yugoslavia and my grandmother fed the family. She had all the courtyard animals – chickens, rabbits, goats, pigs. I have a whole article on the memory of the slaughter of the pig and making it into sausages and prosciutto. So all of this really tied me to loving food and to remember. When we escaped, I kept the food as my connector, connector to my origins, to my grandmother. And I still to this day communicate with food. Food is a conduit of emotions, of history, of a culture. Food is, the table actually, is such a giving place. And in America now even more, a lot of the emails that I get are precisely, “Lidia, your food brings me to the table, brings my family to the table. Thank you.” They want to get back to the table. In America, because of big industry, they get away from sitting at the table and eating good wholesome food. Everybody wants to go back now, and being very conscious, eating healthy foods, not foods that’s pre-made, pre-packaged food by somebody and you don’t know what’s in it. You’re on the Saturday afternoon cooking lineup on KLCS, what’s the feedback from L.A. viewers if any? I get feedback across the country and what’s interesting is they love seeing me, the family, seeing grandma. And always they’ll have questions. So I can tell that they’re getting into cooking. They have questions like, what can they substitute, how do I measure the salt, what does searing do to cooking? And it’s really very valid questions and I love it, because they’re engaged and that they are doing it. Are cooking show fans different when you go to different parts of our country when you meet them? They reflect the territory, they reflect the area, the climate. Each area reflects the different questions, and what they like. Certainly the West Coast they love a lot of the light stuff – the salads, they love the light pastas with a lot of vegetables. It’s not just pasta with a little bit of something. But the question is moving forward, the consciousness, you balance, you make a pasta dish, but you can have 1/3 pasta, 1/3 of the vegetables, 1/3 of protein and you make a nutritionally conscious meal and the West Coast is very much interested in those conscious meals, but they want flavor. What’s the most popular question you get from your fans? Usually it has a lot to do with pasta and vegetables, ever more vegetables, how can they substitute, because in the show, I give them that, I say, “You can make this recipe, customize this recipe to you.” It doesn’t have to be word by word what I say. So I get a lot of that, they really want to take that freedom, “Lidia, can I substitute this?” “What can I substitute for spinach?” Well, it’s wintertime, you can substitute kale, cabbage, except each vegetable you have to be attentive of the cooking time because spinach cooks much faster. I lead them through those little understandings and then they feel empowered. Do you get feedback from fans that your show is like a throwback to a kinder time, a quieter time and your show takes them back? And thank God for CreateTV as well. A lot of people watch and they tell me, “Sometimes I can’t sleep, I want to relax, I watch you on Create and then we relax together.” So yeah, absolutely. When you’re in L.A. what are some of your favorite places to dine or food shop? I am connected to La Mozza and Nancy Silverton, we spend a lot of time with them. Also, we are a partner in Eataly, we just opened that. We are there a little bit more than a year now. It’s been such a great success and we have a beautiful terrace. And we are so thankful and grateful to L.A. Lately it’s been between those two and when I go down there, I do events or classes. When I come down, I spend a lot of time now at Eataly, giving classes, giving demos, doing events, fundraising, and with Nancy Silverton at La Mozza, I would do book signings there and it’s been awhile but I need to come up and do some fundraising for the station. Is there anything you want to add about your TV show? I’m going to be filming. Season Six is running now. What I’m incorporating is “Lidia Celebrates”, Italian style, and my memoir. So what they’re getting is: I talk about food, food being from a place, food expressing a culture, so I talk about my trips, my travels and I bring in this immigrant story. So the show will be again the continuum of “Lidia Celebrates” Italian style and “My American Dream” and some of the food that when I came here I encountered, Italian-American food. So in a way, it’s like my trip through the recipes. And that’s going to be episode 7 of Lidia’s Kitchen and I’m filming that in March. Your memoir is out in paperback in March, can you tell us about it? “My American Dream” is my memoir. I was born in part of Italy that became communist Yugoslavia and we were kept behind the Iron Curtain. The family escaped back into Italy, we spent two years in a refugee camp in Trieste and it was difficult and when I was 12 I came to the United States. So, how food affected me and growing up with grandma growing all kinds of vegetables and animals. Then when I was pulled away, food remained my connector, and I carried it on. So the memoir is very much about the life of a person and how after WWII it was difficult, and how food really made my life. And how it made me who I am. And now, not only do I cook food and I have restaurants, but I’m on television! I never thought about this, that the opportunity was there. I was excited, I wanted to do it, and I still want to do it, I still want to share my philosophy, my love for food with whomever will listen to me. (laughs) So that’s my memoir and that’s in the next season and also there’s some travel back to Italy, and I’m going to be filming. People love when I go back to Italy. I’m going to be going to Italy visiting some of my friends and the producers and the artisans.